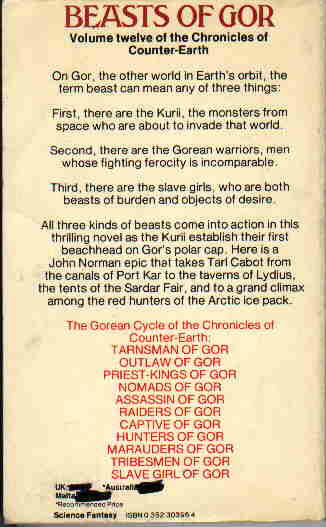 First, there are the Kurii, the monsters from space who are about to invade that world. Second, there are the Gorean warriors, men whose fighting ferocity is incomparable. 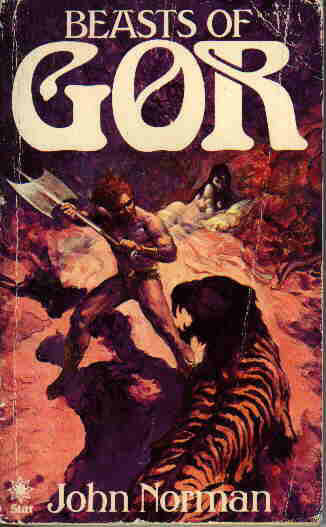 Third, there are the slave girls, who are both beasts of burden and objects of desire. 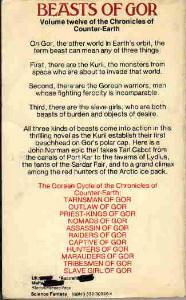 All three kinds of beasts come into action in this thrilling novel as the Kurii establish their first beachhead on Gor's polar cap. Here is a John Norman epic that takes Tarl Cabot from the canals of Port Kar to the taverns of Lydius, the tents of the Sardar Fair, and to a grand climax among the red hunters of the Arctic ice pack.